We have been ranked as the most dependable and leading firm all over the nation and actively emerged in providing a wide array of Carbon Bushes And Bearings, available in various sizes. The rings offered by us are designed using premium grade raw material and progressive technology in tandem to universally verified standards. We manufacture Copper impregnated Carbon & Graphite bush bearings. They are used as a Bearing for shaft of traveling grate in stoker arm for boilers, in power plants, sugar industries, fertilizers industries, paper mills. 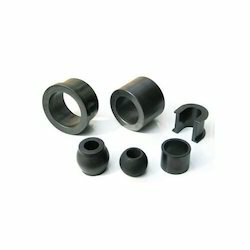 These carbon bearing bushings are manufactured in grade which is equivalent to MY3A grade. 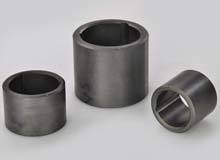 These Graphite bearings are used in travelling grate boilers. We are engaged in offering Carbon Bush, which is extremely praised in the market. Owing to high demand, professionals make these products in varied patterns. Impregnated Carbon has the advantage of excellent corrosion resistance, self lubricity, high coefficent of heat conductivity. It is ideal to choose it as the frictional mating rings. They can also be made into the seal faces, bearings and so on. Banking on the skills of our qualified team of professionals, we are instrumental in offering a supreme quality range of Water Pump Carbon Brush. We offer clients a wide range of bushes that meet the specific application requirements of industry. Our process expertise allows us to offer the range of bushes in exact specifications as required by the clients. Clients can avail from us a wide range of Mechanical Carbon Bushing. These are used as bearings where normal oil and grease lubricants do not work with corrosive liquids and gases and where contamination by conventional lubricants is undesirable. We offer these at market leading prices.